A highly modified, technologically advanced car is being used to showcase the game-changing ‘Racing Extinction’ documentary on how climate change has impacted the state of our planet and how so many endangered species are facing mass extinction. Directed by Academy Award Winner Louie Psihoyos, Racing Extinction warns that in 100 years, up to fifty percent of the world’s species could be lost forever, and notes that five of the planet’s major extinctions have all led to an increase in the Earth’s carbon dioxide. 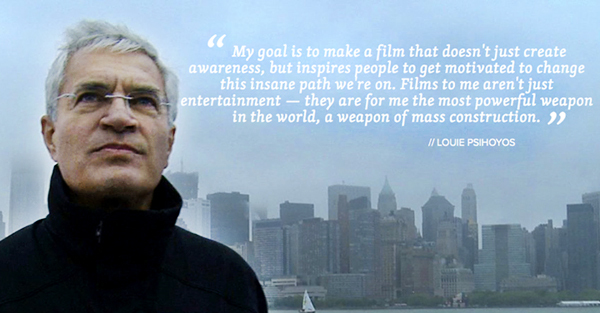 The message behind the film is that we all have the power to make a change, and every small change will eventually add up to make a substantial difference. There is a lot of talk about the Racing Extinction car itself. The Racing Extinction car used in the film is a modified Tesla Model S with a motorized video projector that pops out of the back of the car, and is able to clearly project digital images onto all kinds of surface areas, such as buildings or a snow-covered mountain in Colorado. It has specifically been used to present live projection events to get people’s attention in places they wouldn’t normally stop to view a video, such as at the 2014 Climate Summit at the United Nations in NY. When the Racing Extinction car projects video images and alarming statistics about climate change and endangered species, people stop and watch in awe. The Ocean Preservation Society and Obscura Digital came together to create the projection vehicle that would draw attention to the cause. 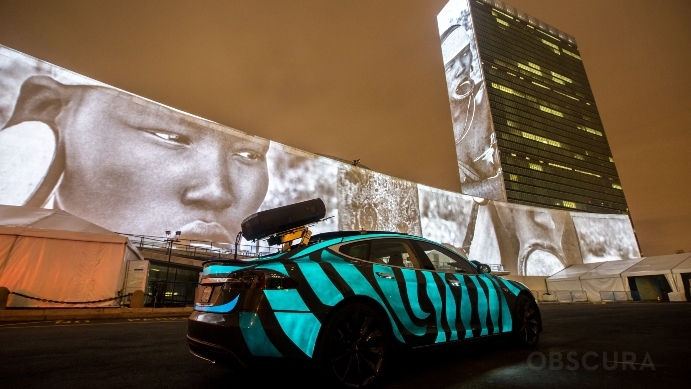 Ultimately each component on the Racing Extinction car works together to create an eye-opening experience for the viewer, one that will hopefully resonate enough to inspire action. The stripes you see flashing down the Racing Extinction car are lit up with electroluminescent paint. That’s right, PAINT that actually lights up and can be turned on and off with the flick of a switch. The electroluminescent paint job is made possible by the new paint product, Lumilor. Lumilor is an Electroluminescent Coating System that lets you turn anything into a real light with an electric charge. Since it is powered electrically, the paint can be wired to other electronics such as the radio or engine revs, or set to flash, cascade, etc. It is applied like any regular paint, and can be made invisible when there is no current running to it. In this case, the Racing Extinction car has a simple, dark gray paint job when it is turned off, with no paint lines or wires shown whatsoever. As for the idea behind the Racing Extinction car, Psihoyos says the “technology illuminates the message.” It is an effective way to project the message, in keeping with the energy efficient theme and drawing in attention to a worthy cause. It’s been said that the electroluminescent paint job showcased on the Racing Extinction car, in this case, represents how animals in the ocean communicate using bio-luminescent light. The car itself is being used as a show piece to get people talking, and is definitely doing a good job at that. 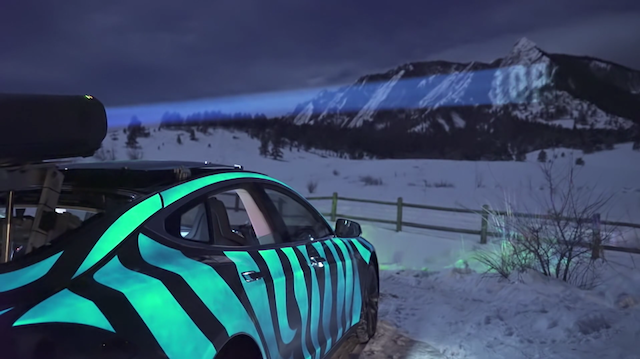 Darkside Scientific did the Lumilor electroluminescent paint job you see on the Racing Extinction car, while Obscura and multimedia artist, Tom Sepe, installed the projector and electronics systems that allow all components to work together. It even has a wifi-enabled control system for selecting the media and patterns to be displayed on the projector. As seen in the film, the car was driven by the awesome race car driver/ environmental activist, Leilani Münter. A self-proclaimed “vegan, hippie chick,” Münter promotes an eco-friendly lifestyle and raises environmental awareness with her racing. For those interested in your own electroluminescent paint job, TD Customs is a Certified Lumilor Lab able to paint with light. Have questions? See our electroluminescent paint FAQ page. Racing Extinction premiered at the Sundance Film Festival in January 2015, and airs on The Discovery Channel on December 2, 2015. Let’s all be a part of the change we need to make for the sake of our planet and future generations. 1 Reply to "Racing Extinction Car Draws Attention with Paint that Lights Up"
If anyone is thinking about getting a Model S (and maybe having it customized at TD Customs…?! ), just wanted to let you know that Tesla has a referral program going on till Dec 31 that gets you a $1,000 discount on a Model S if you have the referral code of another Model S owner. Feel free to use mine: VALENTINA9802. You can just give it to the Tesla sales rep at the showroom or use it online (http://ts.la/valentina9802).